Cheers to a twenty-second trip around the sun and a year ahead that is set to be full of change. I'm happy to have brought in this next year of my life celebrating in the good company of the friends I've made in Boston. It did hit me this weekend with a bit of a heavy heart to acknowledge that I'll be leaving this community to start a new path in January. An unknown city somewhere far west of here lies ahead but there is no fear, thankfully I grew out of that instinct. Sure it's wild to think this change is ahead of me, but for far too long I let fear control my choices and actions. And that space is one I am thrilled to be past thanks to some work on myself and being surrounded by a supportive community. I got a lot of encouraging birthday wishes about what this next year will bring, so I feel gratitude most of all. The process I'm working on to turn my passions into how I spend my life's energy would perhaps not have happened without the inspiration and growth support I received in the last couple of years. Enough sappiness, let's talk about cake. To celebrate the day, there was cake. I look for any excuse to make cake, but a birthday is certainly the best one. I suppose it's not traditional to make your own birthday cake but asking for no gluten, no dairy, and no refined sugar is a bit to request. 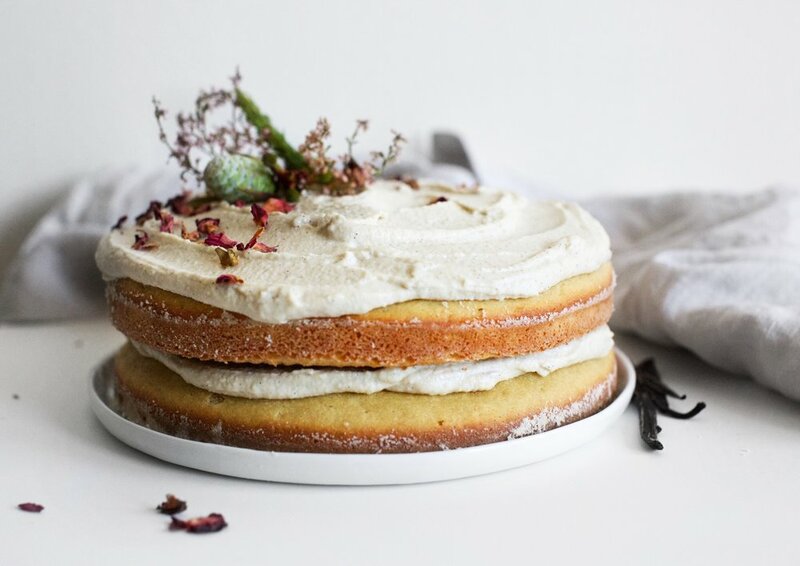 But, in fact, a sensational cake made with real food ingredients can meet these requirements. 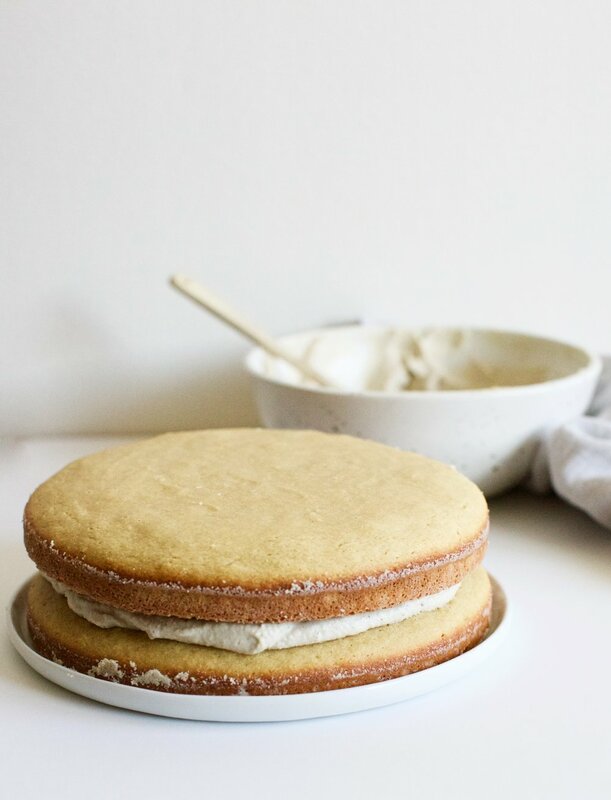 You can add anything to this basic base to customize, but the rich and not-overly-sweet flavor of vanilla is all I ever want in my birthday cake. Soak raw cashews the night (or at least 4 hours) before planning on frosting this cake in 4 cups of filtered water. For the cake, whisk together the eggs, melted coconut oil, raw honey, non-dairy milk, and vanilla extract. Switch to a spatula and mix in almond flour, brown rice flour, baking powder, and celtic sea salt. Preheat the oven to 350°F. Use some extra melted coconut oil and brown rice flour to grease and flour two 8" baking rounds. If you only have one baking round, do this in 2 batches. Divide the cake batter in half by pouring into each prepared baking round. Bake for 16 - 18 minutes or until the middle of the cake has cooked through entirely. While the cake rounds cool, prepare the frosting. 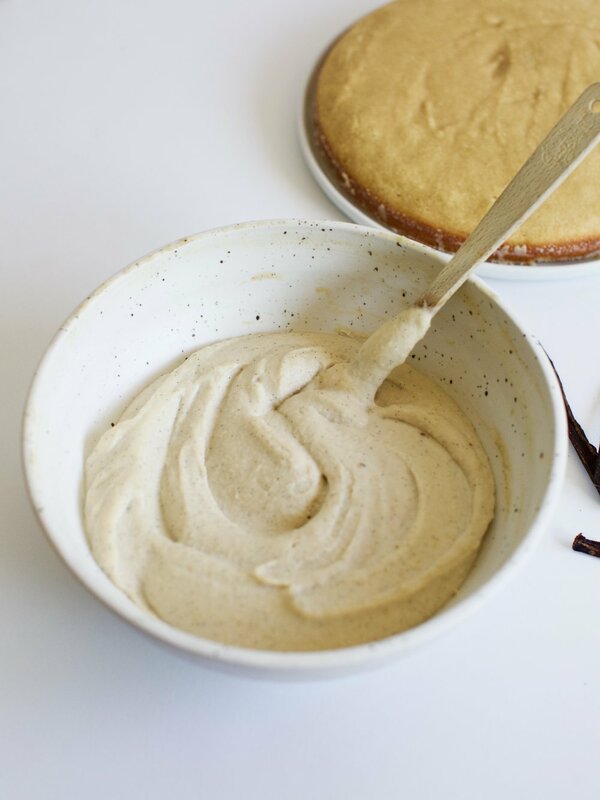 Scrape the inside of a vanilla bean and add paste to a high speed blender. Rinse and drain soaked cashews, add to the blender with all remaining ingredients. Blend until completely smooth. Start with 1/4 cup non-dairy milk and add up to 1/2 cup if frosting is too thick. If the cake rounds are completely cool, begin to frost. Spread about half of the frosting on the first layer, add second cake on top and spread the remaining frosting. Decorate as you like. Best served at room temperature. As the frosting is exposed to the air, it will darken in color but no need to worry. Two of my friends humorously asked if the cake was topped with hummus, however, it is not!